Join in on the hop, leave a comment for everyone and be entered in to win a $15 gift certificate to So Suzy Stamps! I love the Bee Girl - she is so cute and friendly. What better stamp to use for a Friendship Blog Hop. To create the background, I repeatedly stamped Wish on a panel of red cardstock. Before matting the panel with black cardstock, I wrapped it with ribbon. The little bumble Bee Girl was stamped on white cardstock, then colored with Copic markers. Isn't she the cutest? I matted her with red and black cardstock and added her to the card with foam adhesives. My wish is for the friendships we have made to continue into the New Year. Please stop by everyone's blog and see their creations. Sweet card. Love the deep red! I am so glad I met you this year Steph! I am sure we will be seeing each other over at Riley! Best of luck! Love the card and the sentiment is perfect!!!! Besides, I am pretty sure you can't get rid of us THAT easy! LOL Can't wait to see you NEXT MONTH at CHA! How fun is THAT going to be?! Thank you, thank you, thank you for all you have done, Steph! HUGS! Can't wait to meet up too Suzy. the little bee is darling. The different layerings is great. Love this sweet baby girl of yours. Nice coloring Steph! Hope to see you around! and the stamp is wonderful! Great card! I love the bee girl! This is such a cute card! I absolutely love it. Great job! Love your really cute card. My favorite colors, red, black & white and my favorite stamps - So Suzy Stamps. Adore the Wish stamp especially. So sweet!! I love how you created the background and the colors are absolutely perfect! Oh look how cute she turned out! Just bee-utiful, Steph! Cute card! Love the colors. Very sweet card! 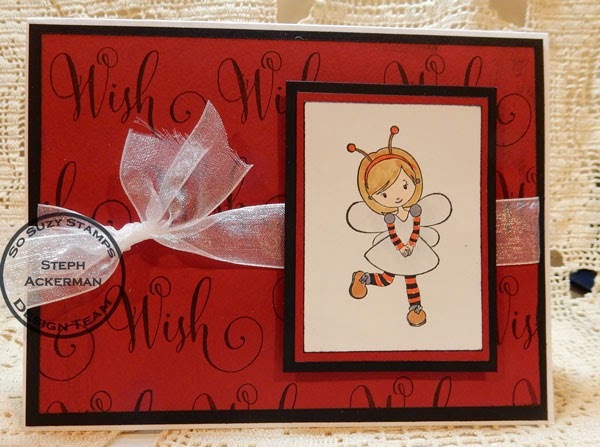 Love the bee girl and 'wish' stamps!